The 2017 BC Taekwon-Do Cup will be held in Kelowna on May 6th at the beautiful University of British Columbia Okanagan Campus. Full information is available on the event site by clicking here. 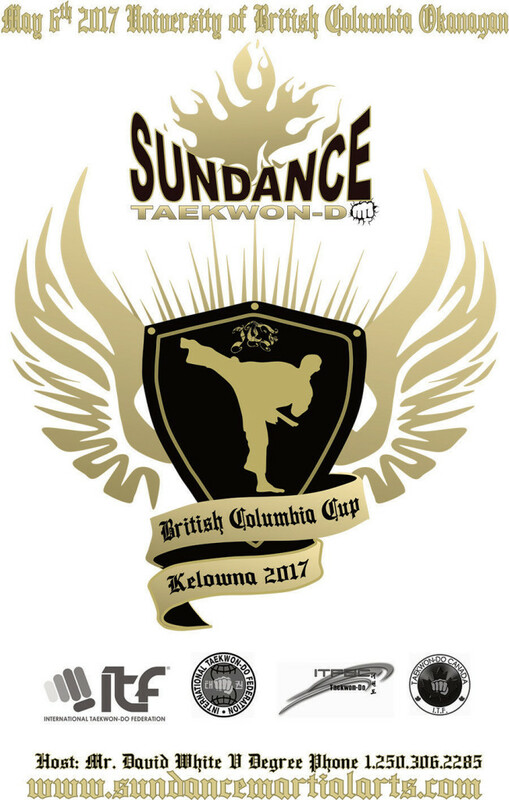 All Coloured Belt and Black Belt members of the Canadian Taekwon-Do Federation International are invited to participate in the 2017 BC Taekwon-Do Cup in the beautiful City of Kelowna, British Columbia. The Championships will be held at the University of British Columbia at 3333 University Way, Kelowna, B.C. For full information and on-line registration, please direct your competitors to the web page at: www.itfofbc.com It is our goal to provide an amazing and memorable experience for all participants and their supporters. This will be a well organized event with an excellent level of competition and sportsmanship, demonstrating the true spirit of the original ITF Taekwon-Do. For the 2017 BC Taekwon-Do Cup, we are also pleased to provide the following features to the tournament program:  All competitors, upon registration at the event, will be provided with the ring location and estimated time schedule for their events.  All participants will register and make payment directly on-line via the Internet. Special Technique (only Jr. & Sr. Black Belts) $20. The official event host hotel is the Four Points by Sheraton Kelowna Airport located at 5505 Airport Way, Kelowna, BC V1V 3C3 (3 minutes from the venue). Cut off for booking host hotel rooms at this rate is April 5, 2017. Please be sure to book your rooms before this date! After that date, rooms may or may not be available at this rate. Reservations can be made via by calling +1 855-900-5505 or online by clicking here. All events at this tournament will follow the Canadian Taekwon-Do Federation International (CTFI) Rules for Coloured Belt Competition and the International Taekwon-Do Federation (ITF) Rules for Black Belt Competition. Copies of these rules are available on the CTFI web site. Special additions to these rules are as listed below. Competitors will compete 1 to 1 and will perform simultaneously two (2) Designated Patterns appropriate to their degree. The first designated pattern will be the third of the last three patterns regarding the level of degree. The second designated pattern is from pattern Chon-Ji to the level of degree. For elimination rounds, competitors will compete 1 to 1 and will perform simultaneously one (1) Designated Pattern appropriate to their degree. For Finals to determine Gold and Silver, competitors will compete 1 to 1 and will perform simultaneously two (2) Designated Patterns appropriate to their degree. The first designated pattern will be the third of the last three patterns regarding the level of degree. The second designated pattern is from pattern Chon-Ji to the level of degree. Black Belts 36+ – 2 rounds of 1.5 minutes each. Groin protection for all males (must be worn inside the trousers). Groin protection or chest protection for females. The current ITF Free Sparring weight divisions will not be used. Instead, Black Belts will be grouped into two to four weight classes depending on the number registered and the weight distribution. All Black Belts, all ages, including Pre-Juniors and Super Seniors, who are competing in Free Sparring must have their weight verified at the weigh-ins prior to 2017 ITF Taekwon-Do BC Cup competing. Weigh-in procedure will follow ITF World Junior/Senior Championships procedures. All Black Belts must be within +/- 3kg of their stated weight or they will be disqualified from Free Sparring with no refund of any registration fee. Saturday, May 6th from 8:00AM to 9:00AM at the venue. Competitors are encouraged to weigh-in on Friday night so they don’t get caught in the crush on Saturday morning.